International Travel - Columbia Pediatrics Medical Group, Inc. : Columbia Pediatrics Medical Group, Inc. Here at Columbia Pediatrics, we are excited to help you plan out your international travel! As always, we recommend informing your pediatrician at least 6 weeks before so that they can help create a custom medical itinerary for your trip. 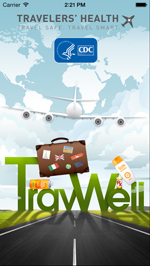 In addition to the CDC’s Travel website page, below is information on a downloadable app from the CDC. Columbia Pediatrics Travel Consultation Appointments will be coming soon…!